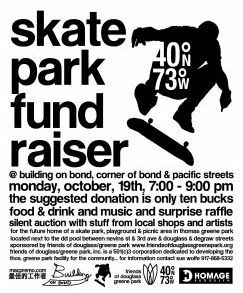 In skatepark development, as with most capital projects, fundraising is the simplest task to understand and the most difficult to accomplish. For most skatepark projects there is a clear expectation that the skateboarding community will need to fork out a significant portion of money for the skatepark. This is where the new skatepark gets real. Once you start collecting money for the skatepark, there’s no turning back. Skateboarders cannot do it alone. This is also the most difficult aspect of skatepark development for starting advocates to understand. Skateparks do not fall out of the sky, (very often). They are the permanent result of hard work by the whole community. Skateboarders are reasonably expected to do their share in paying for the skatepark. Raising funds for a skatepark is daunting. It is an enormous task. Unprepared advocates often struggle for years trying to meet their funding goals. The average skatepark, from the first meeting to ribbon-cutting, takes an average of 3-1/2 years. Most of that time is spent fundraising. The good news is that there have been, and continue to be, lots of individuals and organizations raising money for nonprofits and special causes. You can find out what works and what doesn’t by learning from their experience, and take comfort in knowing that the challenges you face have been met and overcome by hundreds of others. The funding obstacles you face are not unique, and you are not in an impossible situation (even though it may sometimes feel like it). At this stage in the skatepark development you should have a reasonable amount of community and bureaucratic support. Your site, or sites, should be approved (or very close to being approved). The Parks Department should be demonstrating commitment to the project by advising and guiding your group through the process. You should have a contact or two at your local newspaper. Now you can begin to shift your focus away from garnering public support and toward collecting money to pay for the park. It is valuable to understand how parks are typically funded. The skatepark process mirrors that of other types of parks. Learn how parks generate money for their departments and the hosting community. How Much Do Skateparks Cost? Before you can ask for any money, you should know how much you need. Breaking down your total funding goal into smaller chunks will provide smaller, easier goals. It can be difficult to discuss costs that seem uncomfortably large. Understanding the cost of other public facilities will help keep things in perspective. Putting together a funding plan will help you organize a larger body of volunteers and events that meet achievable goals. A collection of things you can do to increase awareness, raise a few bucks, and keep excitement high. A picture is worth a thousand words. Using skatepark concept illustrations can help whet your audience’s appetite. Learn how to keep your books in order legally and securely. It’s everyone’s worst nightmare. Here’s what you can do to prevent your funds from disappearing. When all your work is done, you’ll need to close your accounts.